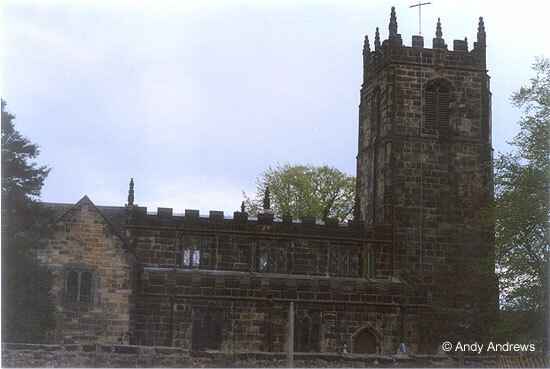 The church is in the centre of the village, beside the turnpike road connecting Chesterfield and Alfreton. In his "History" of the village Gladwyn Turbutt writes that "The earliest reference to a church at Shirland occurs in an interesting fine, dated 22 September 1226" and he goes on to comment that "a dispute of this nature could only have occurred a short while after a new church had been built". According to Nikolaus Pevsner it is "essentially a fifteenth century church. The West tower has diagonal buttresses and eight pinnacles on the battlements". St. Leonard was a hermit - a Frankish nobleman - who settled near Limoges about the sixth century. Writing in 1875, Reverend J. Charles Cox observed that "the memory of this humble-minded hermit seems to have been formerly regarded with much favour in England, for more than one hundred and forty churches still retain their dedications to his name". 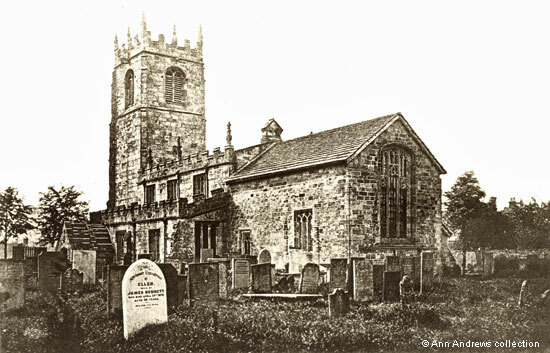 ... "There are three other churches in Derbyshire dedicated to St. Leonard, viz., Thorpe, Monyash and Scarcliffe". The number has increased and there are now around 180 churches dedicated to the saint. Amongst the memorials inside the church is a marble tablet in memory of the web mistress's 3x great grandfather, John Clay (1790 - 1865), and his two daughters, Sarah Lee and Mary Bray (see next page). St. Leonard's Church, Shirland, south side. Many of the headstones shown in the two images below had disappeared. Although the part of the churchyard surrounding the church has been largely cleared of its really old headstones, some memorials are still to be found. These include what must have been a very costly large chest vault to the Bansall family, which is of particular interest to me as Mary Bansall (1799-1844) had been a Clay before her marriage. Unfortunately, these memorials here have not withstood the effects of circumstances, weathering and nature. 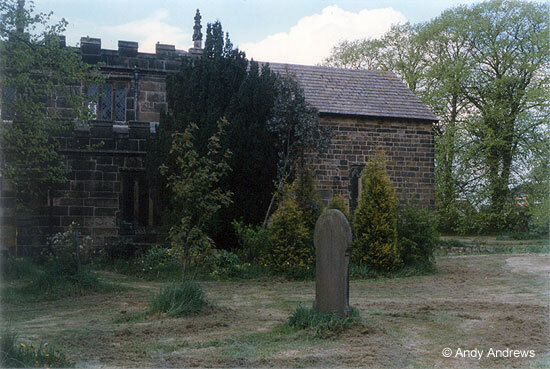 Cox provides a photograph of the church (see below) and the Bansall memorial is on the left, close to the church porch; it surrounded by iron railings that presumably disappeared (see below). When the web mistress last visited the church there was a yew tree almost covering the tomb. 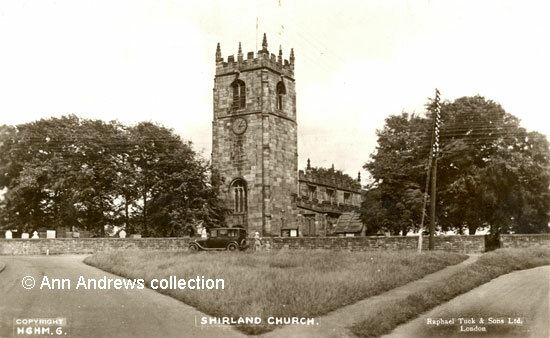 This fourth picture, from Cox, is captioned Shirland Church S.E. and was taken between 1870 and 1875, when the volume covering the Hundred of Scarsdale of his history of the churches was published. It is a heliotype plate and is of such quality that the white gravestone in the foreground is quite clear. The headstone marks the grave of Ellen Bennett who lived in Higham; she was buried on 2 May and was aged 65 when she died. A list of MIs for the church has been checked and Ellen's gravestone isn't listed. 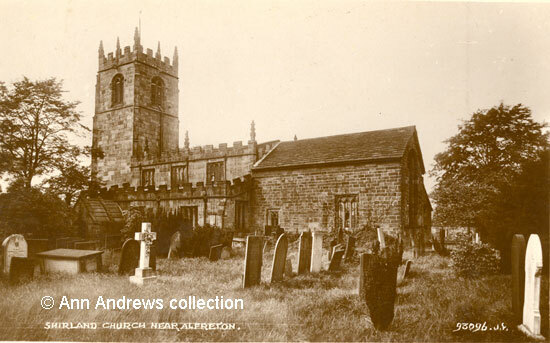 There are also several readable, or partly readable, epitaphs on the 1926 image of the church, above. The white marble headstone, far left, commemorates Charlotte Hagger Siddall, who died in 1882; she was the daughter of William and Charlotte Page. Although you can't see it here her mother, who passed away in 1897, is also named on the stone. Close by is a gritstone [chest] tomb and, from its position, I believe it is dedicated to Mary, the wife of George Bansall of Alfreton and daughter of John Clay, who was buried at Shirland in 1849. Their chest tomb has already been mentioned. Also commemorated on it are some of the couple's children and two of their three grandsons. The railings that surrounded it seem to have gone, although there is a tomb next to the church porch that still retained its railings in the inter war years. The dedication on the white cross with the ornate carved motif begins "In memory of George Beastall". The rest of this dedication is hard to make out but George, who had moved to Southport, passed away in 1899 at the age of 66 years..
On the opposite side of the old highway stands the old manor house, now called Manor Farm, where several generations of my Clay ancestors lived and farmed the land. The names of John and Mary Clay, with the date 1746, are carved on the barn wall of Manor Farm. The Clays in Shirland were part of the family from The Hill, North Wingfield; the branch of the family who lived in Shirland had come to the village in 1695 and built Gables Farm in Higham (which is in the parish of Shirland). The family finally left Shirland in the 1870's, though younger sons had moved to Bonsall, Crich (Dethick), Liverpool, Matlock and Nottingham before that date. My Bryon ancestors farmed at Shirland Lodge. 1. "Shirland Church". Published by Raphael Tuck & Sons Ltd London, HGHM.6. Real Photograph. Printed in England. Copyright. The sender's message included: "We were married in this church". 2 and 3. The two coloured photographs are © Andy Andrews, re scanned 2007. 4. The heliotype plate is from a photograph taken specially for Cox's book by Mr. R. Keene of Derby. 5. "Shirland Church, near Alfreton". Valentine's X. 1. Series, Real Photo Cards, No.93096. First published in 1926. Unused. All other information provided by and © Ann Andrews. Turbutt, Gladwyn (1978, reprinted 1997), "A History of Shirland and Higham" Higham Press p.93 ISBN 0 9504692 1 1. Pevsner, Nikolaus (1953), "The Buildings of England, Derbyshire", Penguin Books. Monumental Inscriptions, Shirland St. Leonard's, Derbyshire Family History Society. No date, but recorded by Margaret and Bill Brooksbank and Joy and Graham Chantry. Mrs. Siddall was born in Sheffield and was the wife of a Higham born surgeon. Her mother, who was widowed as a young woman, had been born in Shirland. She can be found in Kelly's 1891 Directory. The Derbyshire Times of 13 November 1897 recorded the death of Mrs. Charlotte Page of Shirland House on 4 November; she was 82. Mrs. Siddall also died at Shirland House ("Derbyshire Times", 28 October 1882). Some of the younger sons of the Clay family in North Wingfield went to Alfreton, Ault Hucknall, Birmingham, London, Manchester, Salford, Sheffield (all ENG) as well as to Pennsylvania, USA and to Port Philip, later Melbourne, in Australia. Our Genealogy includes an image of my Clay family crest.